When it comes to getting away from it all and communing with nature, few states beat South Dakota. In such an open and well-preserved state, solar power is right at home. This sparsely populated grassland has a temperate continental climate and light-to-moderate precipitation. Seasons are distinct, with hot summers and very cold summers. Despite a high level of storm activity, South Dakota gets plenty of sun. Thus, solar energy is readily available and helps to maintain the natural beauty of the Great Plains and the Black Hills. 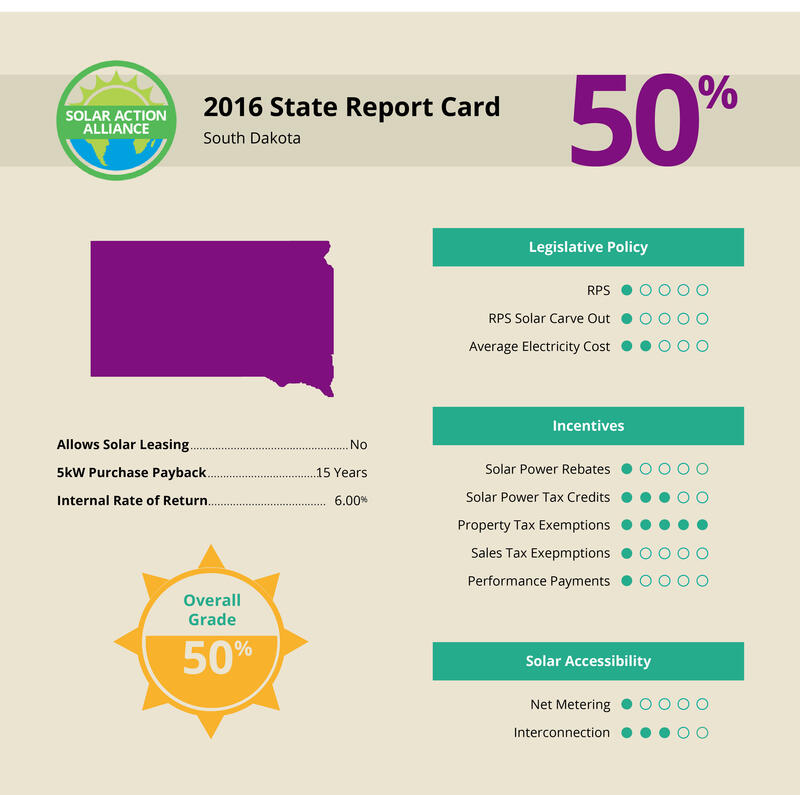 But do legislators make it easy for you to convert to solar power in South Dakota? Let’s examine how much you can personally benefit from running on sunshine via solar panels. Before you can fully understand the benefits of going solar, you need to be aware of the costs associated with both traditional and solar-generated electricity. 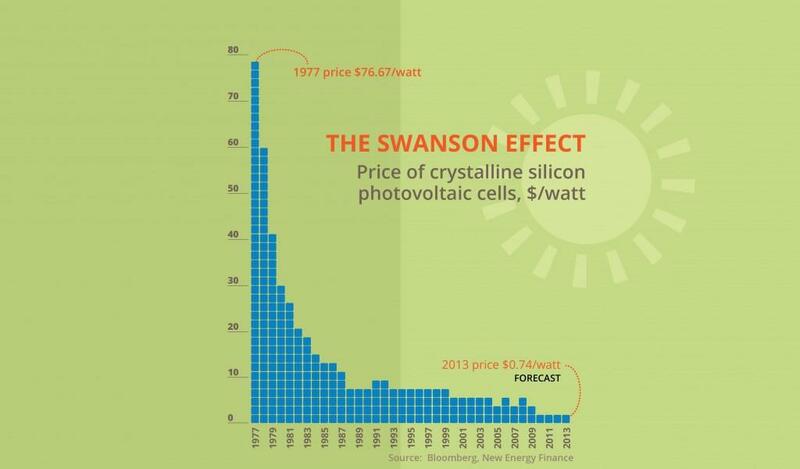 The Swanson Effect graph above demonstrates that solar power, which was quite expensive more than 30 years ago, is now more affordable. Unfortunately, South Dakota grid electricity is also very affordable. So installing a solar energy system won’t save you tons of money right off the bat. It also takes longer for a system to pay for itself (about 15 to 16 years). However, over the long haul (about 25 years, or the life of your solar panels), you can make a significant amount of income—especially as the technology continues to improve. 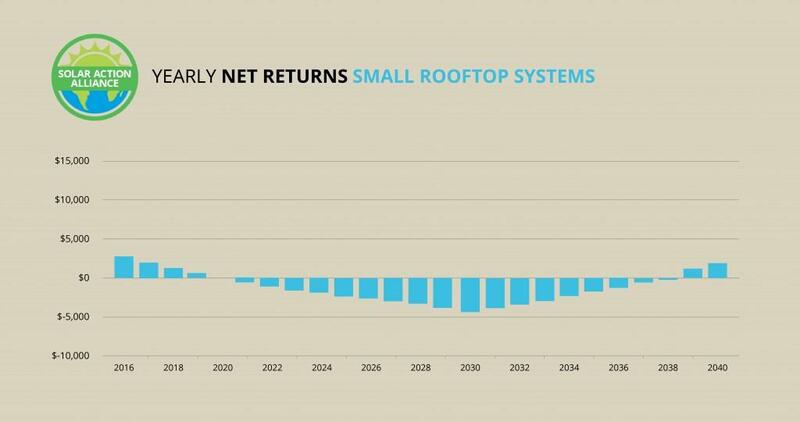 Below, we explain the various returns on investment (ROIs) for a solar-panel installation in South Dakota. 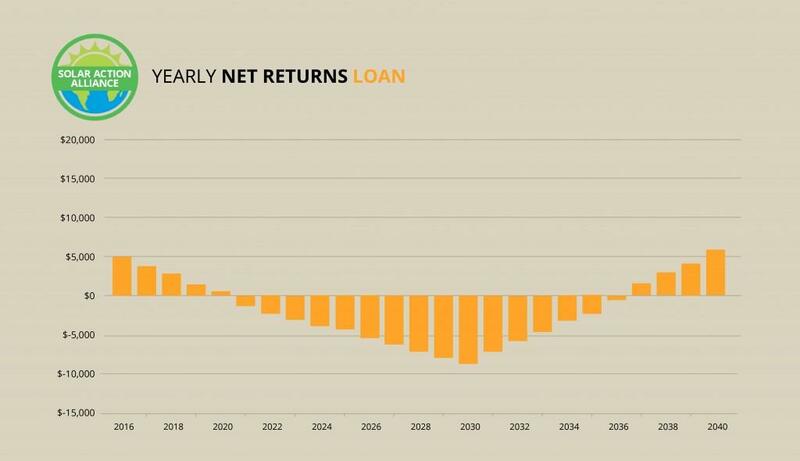 If you look at the chart above, you’ll see that switching to solar power brings you monetary rewards no matter how you slice it. However, the amount of those rewards varies greatly depending on your method of purchase. If you have enough money to pay for your solar panels up front, you’ll make more in the end. 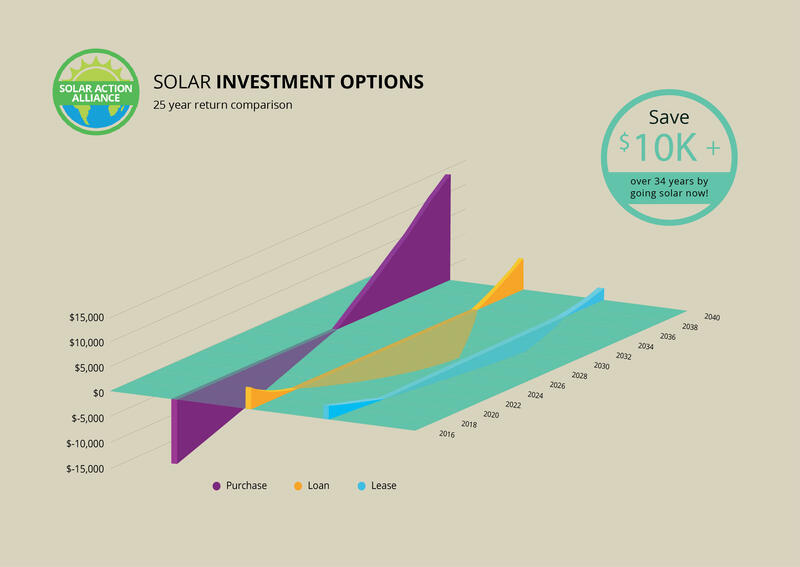 If you buy your panels with the bank’s money, some of your savings will be lost to interest, but you can still come out ahead in the end. While leasing solar panels is an option in many states, that isn’t yet the case in South Dakota. However, we think you’ll be pleased with the three choices you do have, as described below in further detail. The best option for paying for a solar energy system in South Dakota—as is the case in many states—is to use your own savings. While an investment of $20,000 is a major step, that investment is virtually risk-free. In the first year, you’ll get a 30 percent credit on your federal tax return. You’ll have total control over your system and will see energy savings from the first day. By the time your panel warranty expires 25 years later, you’ll have earned over $14,000 to put toward a child’s wedding, your retirement, or another worthy purpose. In many states, taking out a loan to buy solar panels is a great option—sometimes the best option. As we mentioned, though, South Dakota’s electricity rates are low, so you won’t see super-high returns. Nevertheless, you’ll still see returns: over $5,000, in fact! If you qualify for a home-equity line of credit (HELOC) for $20,000, you can install a full-size solar power system and benefit from the 30 percent tax credit from the federal government. While you’ll start ahead, your loan payments (more than $1,000 annually) over the next 15 years will gradually take you into the negative. If you’re the type of person who can see the big picture and doesn’t need instant gratification, you’ll be able to hang in there until the true savings begin. 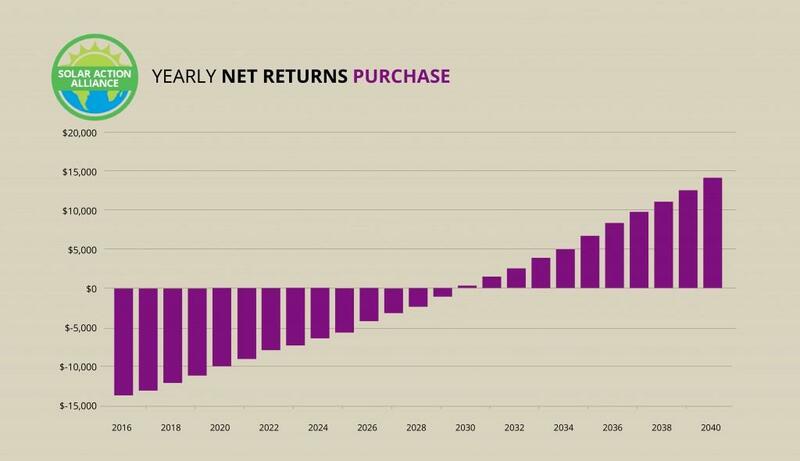 After 15 years, you’ll have paid your loan in full, and you’ll start saving more each year than you had been spending previously. By the 25th year, you’ll have made almost $6,000 with absolutely no down payment! If you don’t have much savings and don’t qualify for a $20,000 HELOC, you can install a smaller system (2 kW versus 5 kW) for less than half that amount. So you see, almost any household can benefit from solar energy in South Dakota. Because the price of South Dakota grid electricity is low per kilowatt-hour, you won’t save as much money on your utility bills as you would in another state. However, you can apply even marginal savings to your loan payments, making the system more affordable overall. Additionally, you still get your federal solar tax credit at the outset, and you’ll be spending money gradually over a number of years, not all at once. 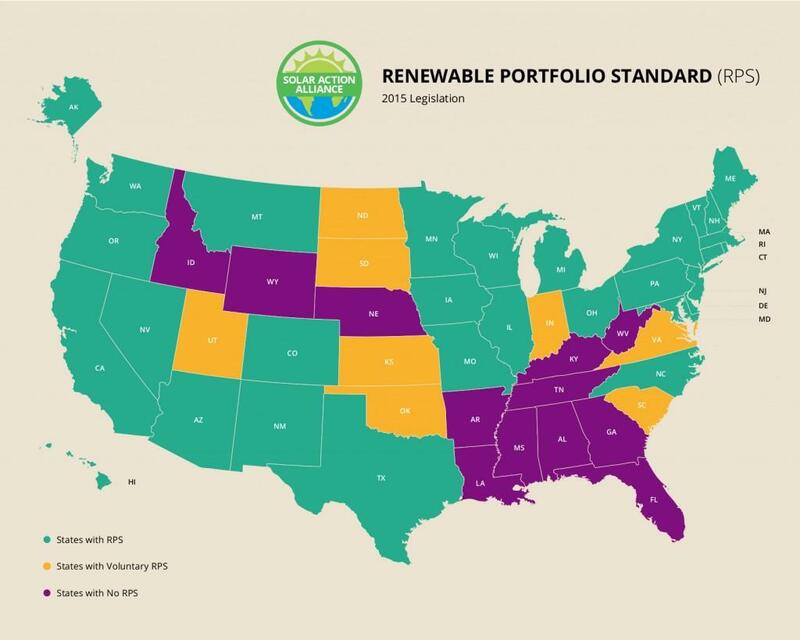 A renewable portfolio standard (RPS) tells state utilities that they must source part of their electricity generation from clean sources, such as solar and hydro. While South Dakota does have an RPS, participation is voluntary, which means it’s not really a law. Moreover, the goal was to reach 10 percent renewable energy by 2015, which has already come and gone. It’s uncertain what the future holds as far as South Dakota’s RPS. It’s clear that voluntary programs are not effective for inspiring major, lasting changes in the area of energy production. That’s because the utility companies benefit little from such changes. It takes stiff penalties to spur them into action. Surprisingly, South Dakota is just as sunny as some of the southernmost states are. Unfortunately, state lawmakers haven’t caught onto the idea that solar power in The Mount Rushmore State is totally viable. More incentives would reduce your costs and, therefore, reduce the time it takes to pay for a solar panel system. South Dakota does have some meager tax credits and an interconnection policy in place, and the property tax exemption is enormous. However, the state is behind the times in too many other areas. By switching to sun power regardless and lobbying for better laws, you can be on the cutting edge of the solar revolution.